The ONE Championship (ONE) family suffered a tragic loss when Chinese flyweight Yang Jian Bing passed away on December 11, 2015 (Friday) at 12.06 PM due to cardiopulmonary failure. The formal hospital medical reports and procedures are still being carried out. He was 21 years old. Yang, a native of China was hospitalized at the San Juan de Dios Hospital in Pasay City, Philippines, after a sudden collapse on the morning of December 10, 2015 while he was jogging trying to cut his weight in time of the weigh-in that evening which was held at SM Mall of Asia Music Hall in Pasay. At the hospital, Yang received the best medical care possible while ONE officials continuously updated his family directly from his hospital bedside. ONE Championship CEO Victor Cui said, “There is nothing more profoundly tragic and sad than when a member of the ONE Championship family, current or past, passes away. Our thoughts and prayers are with the family and loved ones of Yang Jian Bing. We will work closely with the family and offer all the support they need in any way we can during this very difficult time." Cui added, “I want to thank all sports fans around the world for their concern, thoughts and prayers. At this time, we appreciate everyone respecting the Yang family's privacy as they mourn the loss of their beloved son and brother." 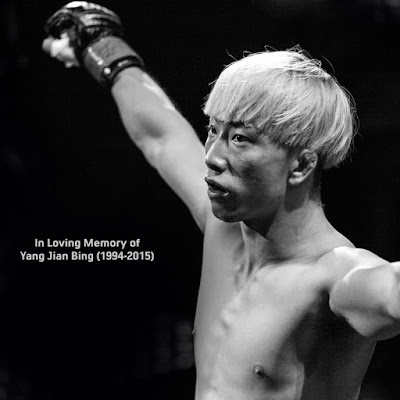 Yang competed in the ONE Flyweight Division and his last bout for ONE was on June 20, 2015 and he was scheduled to compete on the card of ONE: SPIRIT OF CHAMPIONS in Manila on December 11 fight night.